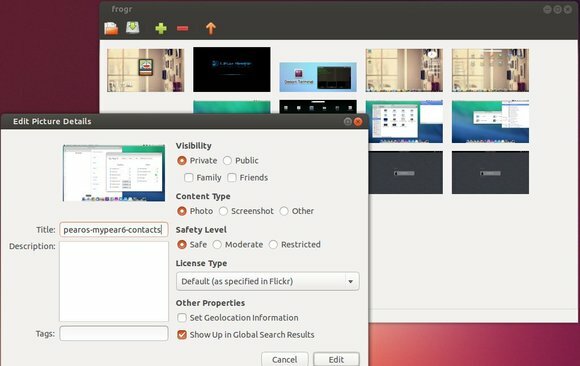 Frogr is a Gnome app allows to manage your accounts in the Flickr image hosting website. It supports all the basic Flickr features, including uploading pictures, adding descriptions, setting tags and managing sets and groups pools. You see, the GUI is simple and very easy to use. Right click on an image file allows you to edit the picture details. This will install the app from its official PPA. So far, it supports Ubuntu 13.10, Ubuntu 13.04, Ubuntu 12.10, Ubuntu 12.04, Linux Mint, Elementary OS Luna.